I just finished up a series of photography classes. At my last class my instructor asked us each to bring a few of our favourite images for critique. Three of the four photos I chose were of children I love at Eagles Wings. As the class was analyzing one of my photos, my teacher asked me what it was that I liked about this specific photo. I replied that although I do love the sentiment the photo evokes, it wasn’t the picture itself that I loved, but rather the child in it. 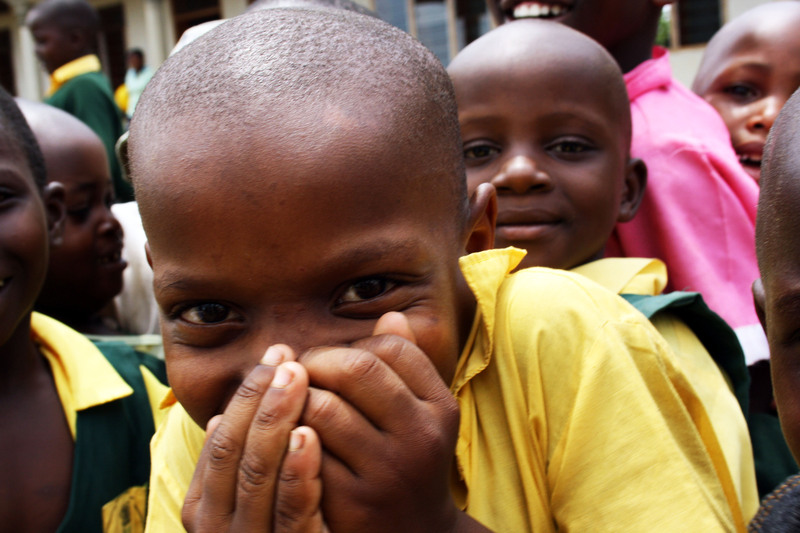 I went on to tell my classmates that I had snapped this photo the first time I met Wasswa, how he was just so full of mischief and how I was simply drawn to his radiating joy. In the moment I snapped that picture I didn’t know he had lost both his parents and was being raised by aging and unwell grandparents, or that he daily had to carry the heavy burden of hauling water from the community well that was no short distance away. I continued on to tell these people I hardly knew that I came home and decided to become his sponsor and that on a subsequent visit Wasswa spotted me all the way across the school grounds and came running, barreling really with all cylinders fired, right out of his desk in the middle of class just so he could leap into my arms for a great big bear hug. All this I said, was why I loved this photo, even if it wasn’t photographically perfect. I looked up to eyes full of tears, and suddenly this picture was no longer about a histogram or white balance or saturation, it was about a little boy that lives oceans away. My instructor’s reply was simply “Wow, that is real.” It is real. This picture to me, and now to them was not just another photo flashed across a TV screen meant to pull on heartstrings. It was real life, a moment of joy and silliness I had witnessed, made real to them too. One of my classmates told us she wished she could transport herself right into the middle of the moment in the photo. Right in the middle of all that wild and crazy piece of happy. One of my classmates also later came and told me she would never forget what I had just said. She would never forget the face of that child and the story he lives. I always struggle with telling stories about my experiences overseas. To tell them with compassion without reducing the person who lives the story to just another poor African, because they are certainly so much more. To speak without rising up on a soapbox of judgment for witnessing ignorance of the way the world is, that we so often live with over here on this side of the world. And finally my own emotional ponderings and wrestlings sometimes keep me silent as well. I came home from certain parts of post-war Africa broken and unable to verbalize what I had seen. Only now, a few years later, are the people in my inner circle starting to hear about some of that heartbreak. Out of the ashes, beauty will rise. And yet these stories, some of them, they beg to be told. The unawareness, the inaction, I sometimes see is not I believe due to cold hearts, but rather due to the great distance between us and the rest of the world. Stories, real people, they make that distance fall away. You and I, each of us, have a responsibility to narrow that gap. For many of us, that means finding ways in the midst of our everyday ordinary to make what happens in the world, real both to ourselves and to others. To connect with one child, to feel the pain of another person’s sorrow. One thing, one person at a time. Will you join me in praying that the children of Eagles Wings Children’s Village would grow up to be men and women of character? Because those kind of people are rare, and we hope our children will have the courage to choose a path of integrity. To choose to become honest and hardworking in a land where corruption and material success seem to have become synonymous. To quote the oft quoted poem, we pray that where two roads diverge, they will take the road less traveled, because that will make all the difference. I know this isn’t a new image to many of you, but it was the image I speak of in this post. It is, quite simply, one of my favourites. Thank you Jaimee for this amazing post! Hi Jaime. Thks for this blog Very thought provoking and an interesting read. I would like to speak with u about sharing your journey(s) with our ladies at pArkside. Would u be available to do that this summer ? Let me know ok. I am thinking along the lines of Christian love and wounded people. Hope to hear from u soon. I would love to come speak to the ladies at Parkside. I can come this summer sometime. You can ask my Mom for my e-mail address if you like and we can arrange a date.